In general, people choose for their bedrooms more cozy and delicately-looking designs. However, there is a not so popular style, but very interesting, the industrial bedroom design. It is indeed more masculine and aggressive, but that does not mean that it does not deserve a place among the interior design in your home. Check out these industrial bedroom designs and read about how you can create your own room in this style! 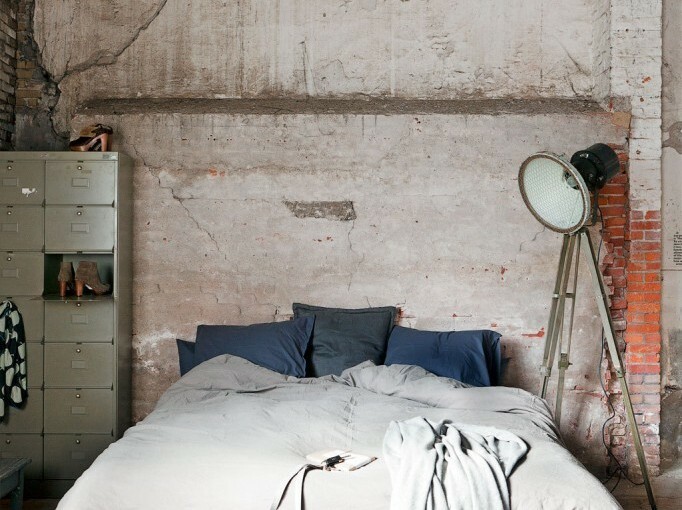 Remember to always use a brick wall when creating an industrial bedroom design. Bricks express the exact raw nature of such a design and it helps in creating an interesting room. If you don’t like the way normal bricks look, you can try to paint them in white or gray as an alternative. These neutral colors help in harmonizing the other colors in the room and allow you to use some brightly colored points of attraction throughout the room (cushions, rugs, etc). Another important element in designing an industrial bedroom is the art. Even though it might seem paradoxical in the context, an oversized art piece can reinforce the raw, unfinished design. It can be a painting or a big statue or, basically, anything you like. The best part here is that you can choose nonconformist works of art or modernist and abstract ones, because they fit perfectly the rest of the decor. Don’t forget to use texture! Texture is very important in an industrial bedroom design. Simply because it’s industrial, it has to look somehow unfinished or unrefined. Along with the brick walls, you should use unpolished metallic decorations or furniture, unfinished wooden boards or even bed frames and an original idea is to use chairs made from logs. Log furniture is actually a great plus to this kind of design and it’s not so hard to craft it yourself if you like it.